Thanks to our great volunteers (above) for the pack up at Jazz Festival. You are the greatest! Also thanks to Astro Towing who brings our trailer to and from all festivals. 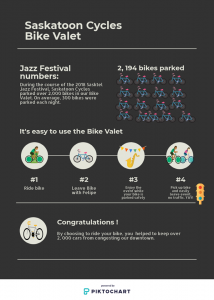 Are you curious about the number of bikes parked during the festival? Check out the stats below. Are you interested in taking a weekend-long course by Can Bike for instructing people to ride a bike safely? There is no planned date or cost at this time. We are just surveying members to see if it would be worthwhile to offer this course in our community. Once certified, cyclists would be hired to work on a part-time basis instructing courses for Saskatoon Cycles. Please respond to info@saskatooncycles.org. 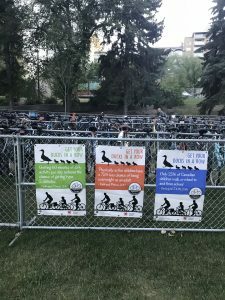 July 17-22: We are seeking Bike Valet volunteers for Taste of Saskatchewan. To sign-up as a volunteer or for more information, please contact our Bike Valet Coordinator, Felipe at bikevalet@saskatooncycles.org. Plus, check out these great banners from the School of Rehabilitation Sciences and Sask Physio Association! LiveableYXE is laying the groundwork for next year’s Open Streets event, where streets are temporarily closed to automobile traffic to favour walking, jogging, bicycling, dancing, yoga, or other social activities. Gil Penalosa does a pretty solid job of capturing the spirit: “People traffic replaces car traffic, and the streets become ‘paved parks’ where people of all ages, abilities, and social, economic, or ethnic backgrounds can come out and improve their mental, physical, and emotional health.” If you are interested in getting involved, please contact Brodie. Slow Roll volunteers are needed. 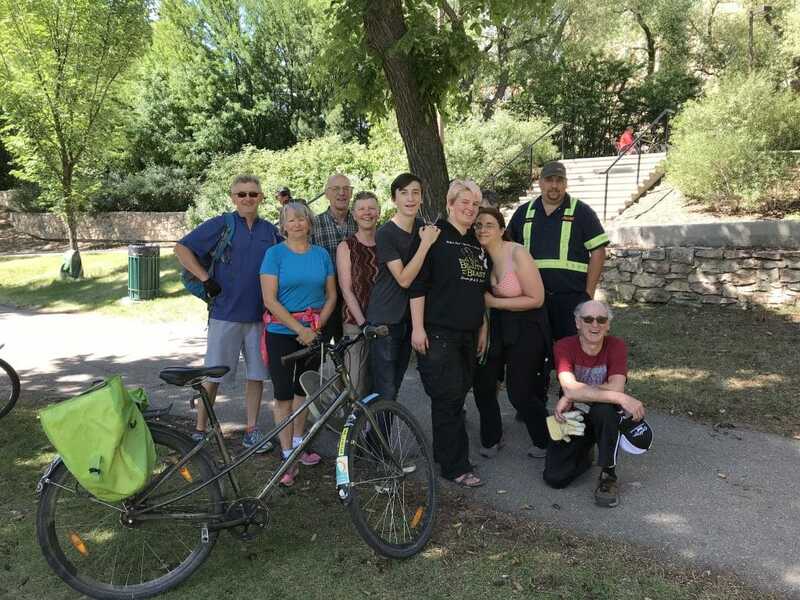 If you are willing to lead or to help organize these monthly community rides to different parts of the city with other enthusiastic cyclists, please contact info@saskatooncycles.org. 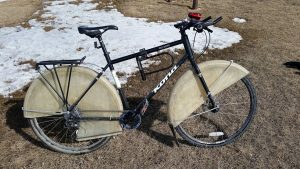 Do you struggle with keeping your bicycle clean throughout the seasons? Check out this creation by local year-round cyclist, Alex.